I finally had a Tuesday evening free for a change–usually it’s a gym night but I had an appointment in the morning before work so I just worked out before that appointment. It’s nice having some time in the morning to get my workout out of the way because I’d much rather have my evenings free. I just can’t commit to getting up super early all the time to do that, so it’s just a once in awhile thing. 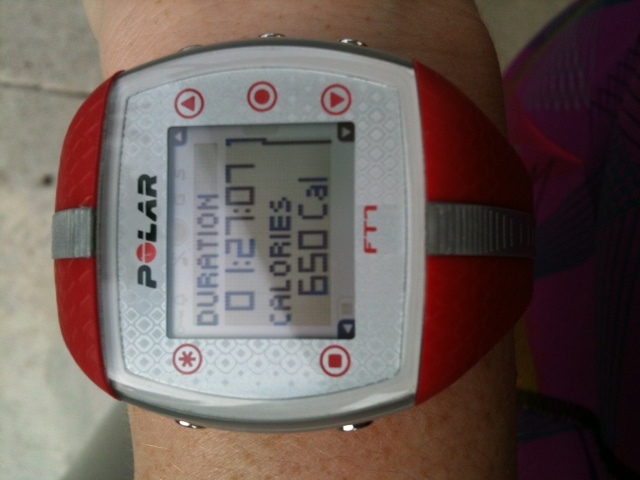 A nice calorie burn for an early morning workout (when I am groggy and so not awake). I planned on having a friend over for dinner recently as a thank you for kitty-sitting while Michael and I were in Texas. It was really just an excuse to invite her over and make her dinner. 🙂 She does so much for everyone in her life and I love having a chance to thank her in a way she’d like. She LOVES all of Michael’s cooking and had a special request: his fish n’ chips. It had been a long time since we’d made it, maybe sixth months or longer? I got all the stuff for dinner and then she had to cancel. An elderly friend of hers fell and had to go to the ER. Thankfully, her friend was okay. We rescheduled and I wanted to try this recipe. I already had some tofu in the fridge for another recipe I never made (miso soup) and decided to try this recipe because another blogger recommended it highly. It sounded really good to me. 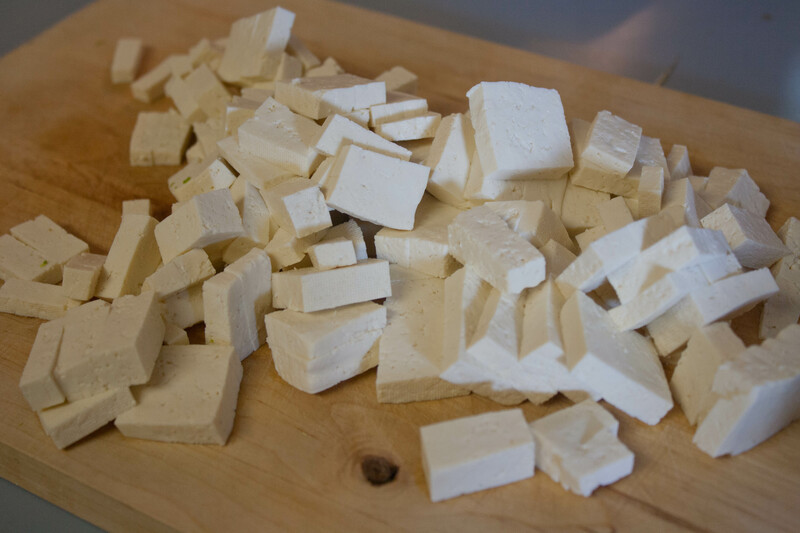 1 Block Tofu, extra firm, 14 oz, drained, pressed, and cut into bite-size pieces. Heat a wok over medium-high heat. 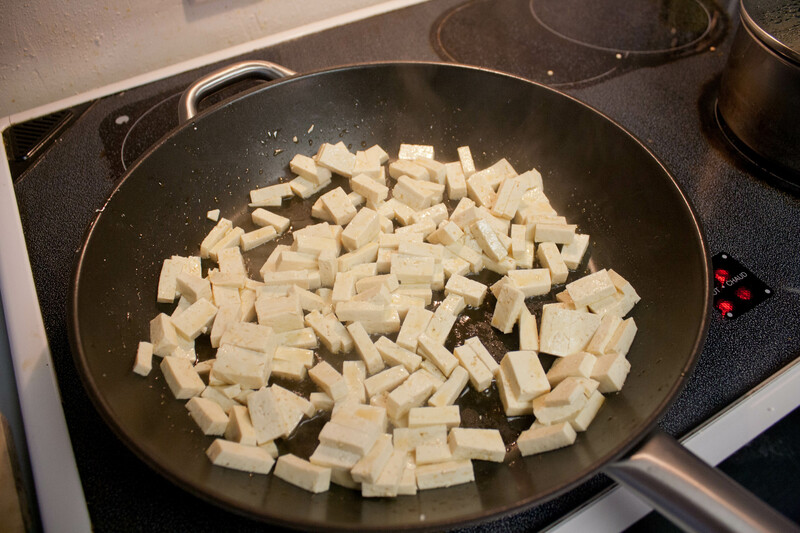 Spread the tofu out in one layer in the pan. Using a spatula, press the tofu. The liquid will squeeze out and boil away, and the tofu will begin to turn golden. The more water that evaporates, the sturdier the tofu will be, so be gentle at first to prevent the tofu from breaking up. After several minutes, flip the tofu over and press the other side. Add the sauce and stir to coat the tofu. Turn off the heat. The sauce will bubble up, reduce, and form a glaze. I made a salad with lettuce from our garden and I added some raw broccoli and cauliflower to it. When Star came over she brought her absolutely delicious bean salad and I tossed that on top of my green salad (perfect). Then I got to work. Poor Michael wasn’t much help in the kitchen–he was a complete zombie because he’d biked 97 miles in the last 7 days and had clearly just hit a wall. I gave him the task of cooking the Israeli Couscous. While he did that, I made the sweet chili lime sauce. It was super easy. I added more garlic (2 instead of 1) and next time I’d probably add a third clove to it. Star showed me how to press the tofu and then she cut it into small pieces while I got the other things going. I’ve never worked with tofu before and had no idea what to expect, what was normal, how long to cook it, etc. She definitely helped a lot with that. At first I was going to sautee some kale from the garden and mix that into the couscous but there was just too much going on. I decided we didn’t need a salad and couscous and tofu AND kale. So no kale and it was fine without it. I started cooking the tofu in the skillet with sesame oil (it smelled so good) and then eventually poured in the chili sauce. It smelled fantastic as it cooked down! I was so excited to eat dinner! I dished it up on the couscous (no butter or oil added) and sprinkled sesame seeds on top. The three of us went outside to eat dinner on the back porch. It was a warm night after an 85+ degree day and the breeze was pleasant. We ALL LOVED the recipe. Hands down, this is the best recipe I’ve tried in a very, very long time. It was the kind of meal I didn’t want to end. It was the kind of meal that I was SO glad I worked out that day for because I had second helpings! And I don’t usually do that. In fact, all three of us had seconds–even Michael who doesn’t like tofu! 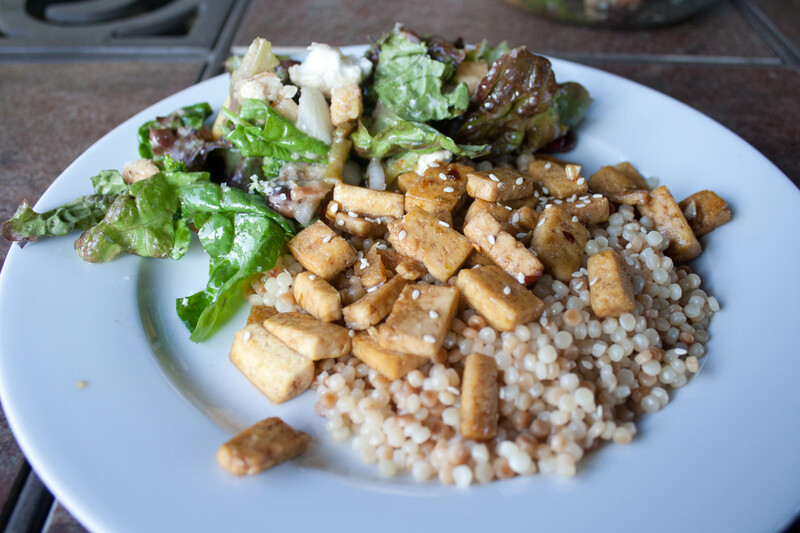 I kept my second helping to just more salad with some leftover tofu on top and skipped extra couscous. All in all, I loved every single bite of this recipe and Michael and I are already looking forward to making it again with chicken or shrimp. We both think it would work well with either of those things. 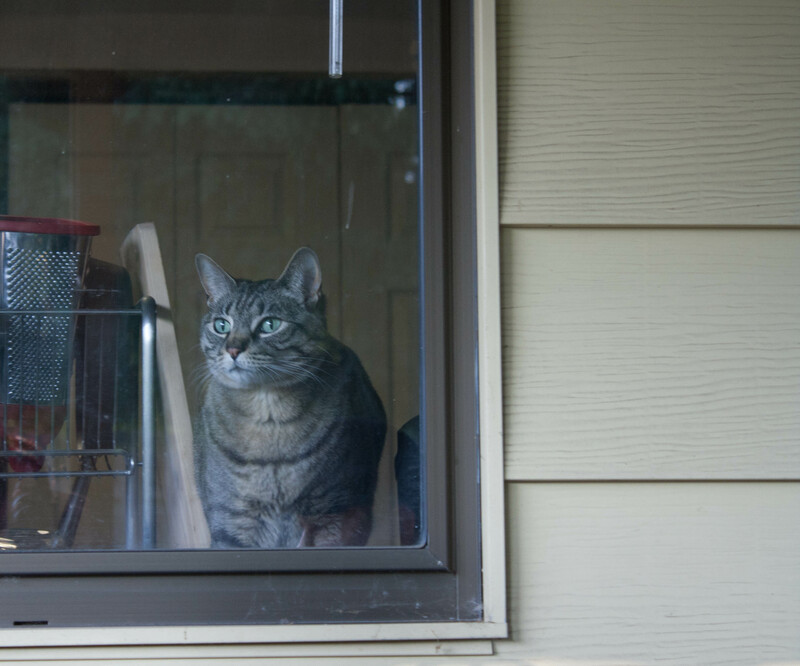 While we were sitting outside eating, Fat Kitty jumped onto the counter to watch us (bad kitty!). Try this recipe. Seriously. SO good. I was kinda bummed there weren’t enough leftovers for me to have for lunch the next day…. We sat outside chatting as the sun started to set, enjoying the late summer evening. 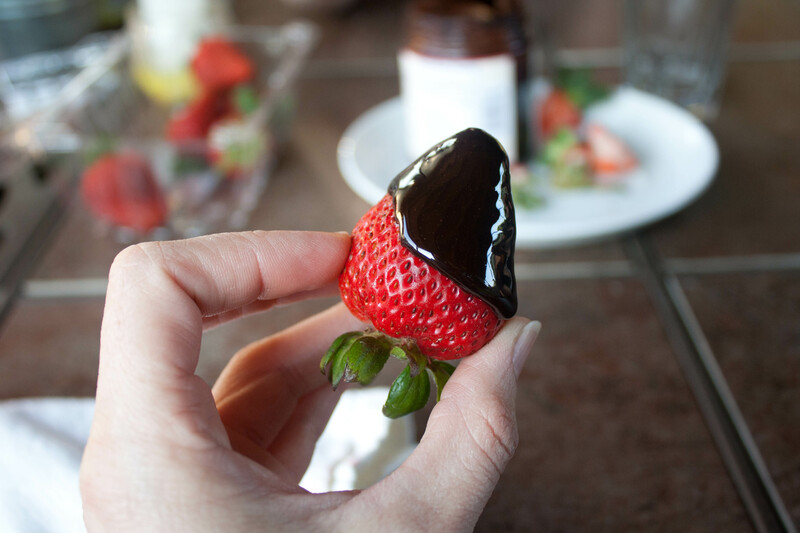 I brought out strawberries for dessert and Star had the brilliant idea to dip them in my Wax Orchards chocolate sauce (it’s low calorie and diabetic-friendly). She’s a genius. How good does that looked? Give this recipe a try, with tofu or chicken it doesn’t matter–it tasted so good and I will definitely be making it again. QUESTION: What is your favorite way to use tofu? Definitely make this! It was so good I’ve been thinking about it for days and I can’t wait to make it again. 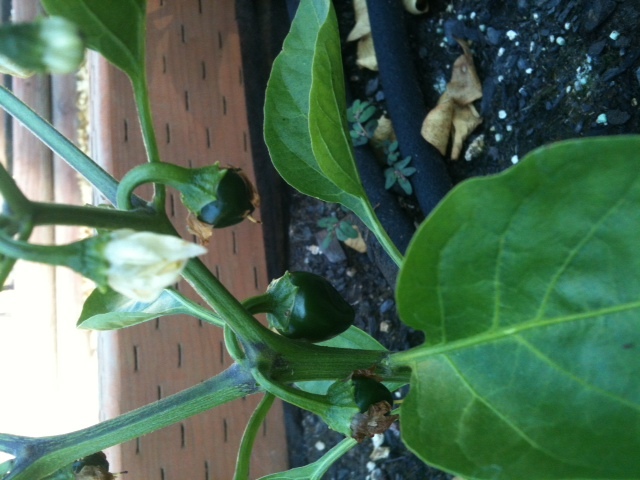 Sweet chili lime? yes please!!!!! LOVE the picture of fat kitty too. He’s ADORABLE!!!!! Have a great Thursday Lisa. Open package, Flush down toilet. Normally I agree with you. I think I eat tofu about once a year and it’s usually at a Thai restaurant. 🙂 I don’t want to eat engineered food and I consider tofu and soy to be pretty engineered. That’s why I’m going to try this recipe again but with chicken! I never make tofu! I like it when I have it (unless it’s the mushy version–I like firm) but I live with carnivores so not sure I could slip it by them. Looks good though! I rarely eat it but I prefer the firm as well. You could totally make this with chicken for your carnivores. I bet marinating it would make it even better. Good idea. 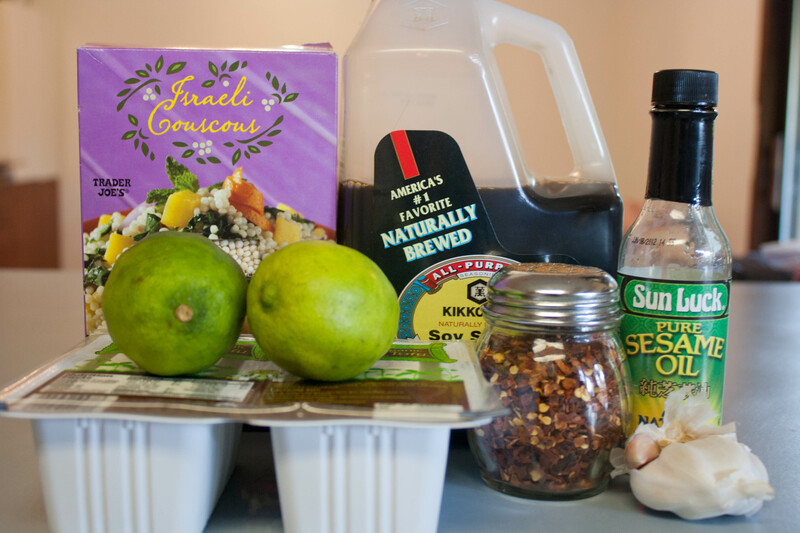 Hi Lisa, here’s a post I wrote with my favorite marinade for tofu. We have it a lot, even though with busy schedules sometimes there’s very little time for the marinade to actually soak in. It still turns out well. Congrats on being an adventurous chef and trying the chili-lime tofu when your friend was over, even though in general you say you don’t like it and you hadn’t used it at home before. Thanks for the link! I will check out your post on the marinated tofu. This sounds so good (but with chicken- I’m allergic to soy) but bf won’t eat anything with peppers or any kind of heat. Maybe I’ll try it one day when its just me eating though. And those strawberries look divine! We’re definitely making it again but with chicken. And don’t worry, this recipe wasn’t spicy at ALL. I followed the recipe closely (I added a bit more garlic only) and it wasn’t spicy at all. It was sweet and savory. Hmm… Maybe I’ll make it for myself and have him try it then. LOL Maybe he’d even like it! It is so hard for me to find recipes we both really like. How is tofu possibly more “engineered” than chicken? 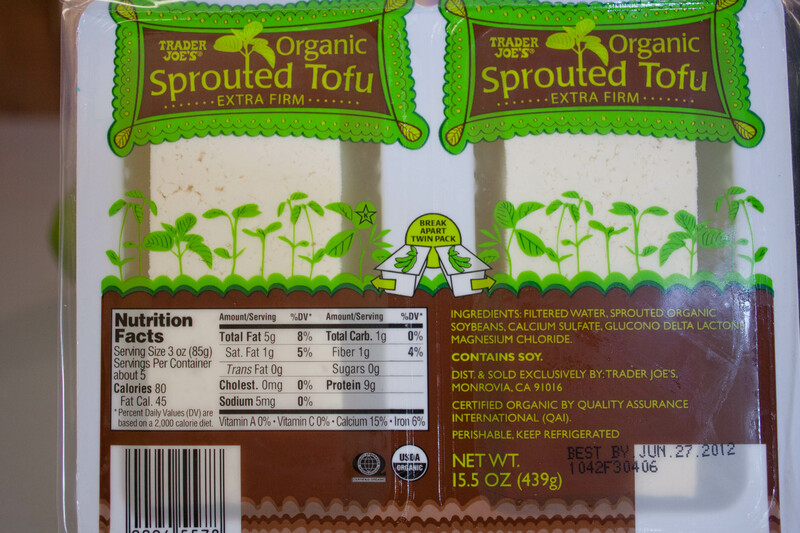 You can buy organic tofu. It’s a great source of non-meat protein. And there are a million ways to use it (just check out any Asian cookbook). It’s like what I heard someone say about vegetables once – if you don’t like them because the ones your mom (or whomever) cooked were flavorless and not tasty, it means they were not cooked right. Tofu is the same way. The tofu recipe sounds SO good. I don’t use it often enough. Come to think of it, I have some in the fridge that I should probably use SOON! Thanks for the idea! Fran@ Broken Cookies Don’t Count recently posted..Should We or Shouldn’t We? I’m happy to pass this gem on. It was really good. Sorry if I sounded defensive about tofu. I’m just a huge advocate and chicken sometimes scares me…:) Also, if you’re frying it, don’t mess with it. I have to resist the compulsion to stir while cooking (anything) and I always want to toss it in the pan. Seitan and tempeh are fun, too. It did seem like you were mad and as a general rule I try not to debate vegetarian/vegan/carnivore politics. It’s just a lose-lose conversation. I’m glad you wrote back, though. 🙂 For me it’s a personal choice. As an ex-vegetarian, I feel much better eating meat. We do our best to buy organic meats –Trader Joe’s is the best I think. I’m actually not a vegetarian at all…ha. I’ve gone vegetarian in the past, too, and sometimes it’s worked and sometimes – like you – I feel better eating meat. I just get a little concerned at the quality of meat and meat production in the US…. I’ve only used tempeh in stirfrys – I just chop it up like tofu. I think you can marinate and grill it, too…like tofu or meat. That’s cool. I just go with what makes me feel better. I will look for tempeh the next time I’m at Trader Joe’s. I want to try it. Hi Lisa, I’m glad you liked the tofu recipe– if you were vegetarian and didn’t use tofu or tempeh, I can see how that might have been hard. 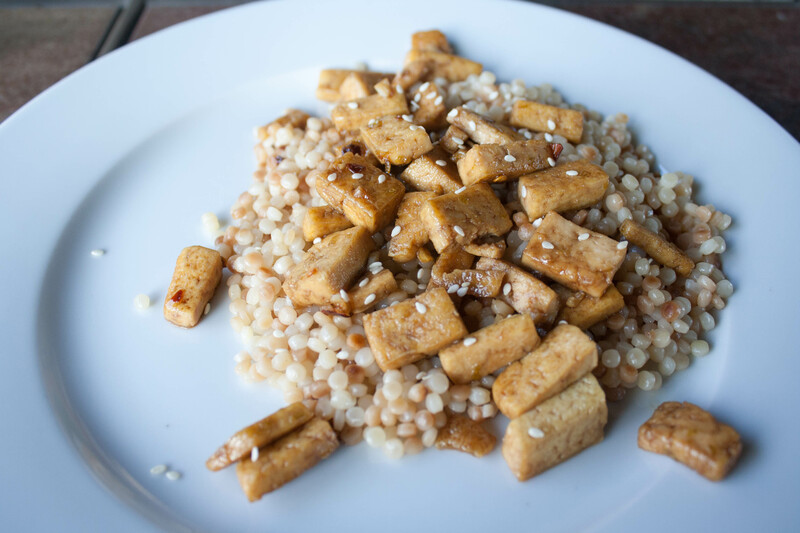 I use marinated tofu a lot and have a recipe for a good ginger garlic tofu marinade on my blog. Maybe I’ll add that link to a comment so you can see it. 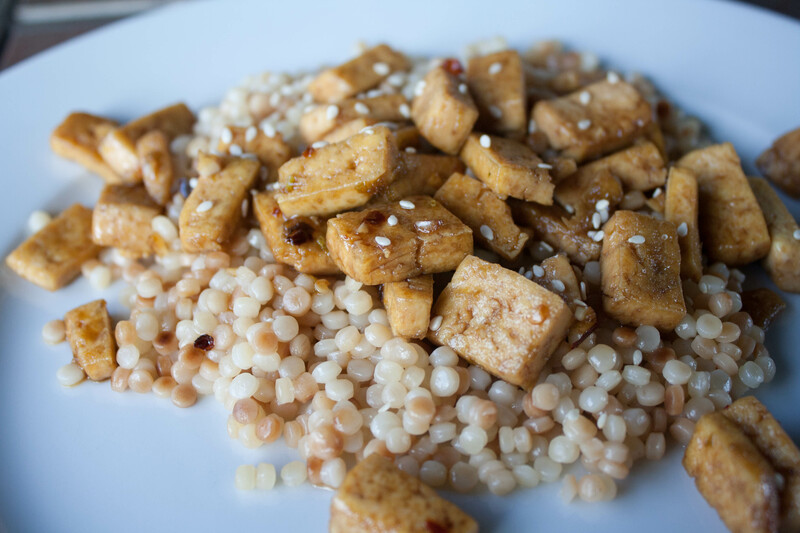 Meanwhile here’s a link on how to cook tempeh. I agree with Ginger that organic, traditionally prepared soy is nothing to be afraid of– it’s quite healthy for you, reducing risk of breast cancer and cardiovascular risk. I am not a vegetarian now either since I eat fish these days, but I was vegetarian for many years and raised my family that way. When I was a vegetarian there weren’t a lot of the options that are available now. Back then it was mostly just those Morningstar veggie burgers and fake chicken nuggets. And I also didn’t cook, so I rarely ventured into the tofu section. I just didn’t know what to do with it.